*Hunting dates are at the beginning and the end of our season is dependent on cool weather, hot weather is too hard on the dogs. For Oct, a good frost enables us to get in the field sooner and a cool spring helps us extend further in to March. Check on Thorn Bottom Hunting Facebook page for changes due to weather or bird supply. "The time has come for me to write a new opening letter for our Thorn Bottom Home page. It’s hard for me to believe that we have now been open for 24 years, time does indeed fly. I think back to that first year in 1996 and what Ann and I hoped our business would be like in 20 years and now that time is just about here." "I wanted to offer pheasant hunting like I remembered as a kid growing up in Paulding, County Ohio. I defiantly didn’t want a “kicking chickens” type preserve that you had to throw the pheasants to get them to fly. I’ve been a hunter since age 6 so any pheasant hunting I was going to be associated with ​had to first and foremost be as wild as humanly possible. Pheasant hunting like I remember doing with my dad, uncles, and cousins, the event that it was back then, something to look forward to each new season." "Being able to achieve that Wild Hunting Flavor of yesteryear is what we are most proud of at Brad Dysinger’s Thorn Bottom Hunting. 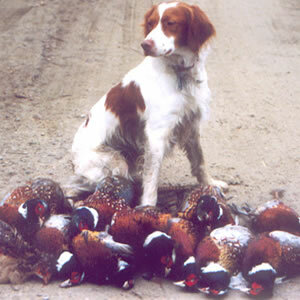 We offer that unique blend of dogs and guides, cover and birds, friends and relatives that make Thorn Bottom what it is, a wild pheasant hunt and a place to remember what hunting is truly about." "So if you are looking for that place to escape to and enjoy pheasant hunting like it used to be in a slower time in the past, please come and try us. I think you’ll be glad you did." In 1996 after spending 23 years trap shooting and working for Beretta USA I came home to Paulding County and with my wife Ann, opened THORN BOTTOM HUNTING. The area you will hunt at THORN BOTTOM is the same place that I hunted as a kid I can still show you the spot I shot my first pheasant, rabbit, quail, and deer, all fond personal memories of mine. At THORN BOTTOM that is what we sell, a great hunt with the Best Cover Anywhere sure, but more importantly memories. Bring your kids, wife, dad, friends and try a hunt with us. We don't think you'll be disappointed. The year round maintenance of THORN BOTTOM is for the sole purpose of hunting. Our farms include wetlands, brush piles, oxbows, woods and food plots. When you hunt with us you or your group are assigned your own area to hunt. No other group will be in your area. Our areas range from 25 acres to 160 acres depending on the size of the group and the terrain they want to hunt. We stress hunter safety. Flame orange is required as well as some type of eye protection. Nonresidents of the State of Ohio do not have to have an Ohio hunting license but we require you to have one from your state or passed a hunter safety course.